First the pies! 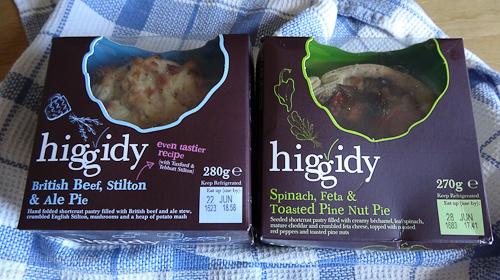 Finding these Higgidy pies was a bit of a challenge for me in the first place, mainly because of my rural location and lack of access to a wide range of supermarkets, however I am glad that I persevered and finally tracked them down in the little Co-op store opposite Glasgow Central Station on one of my frequent trips up and down on the train. 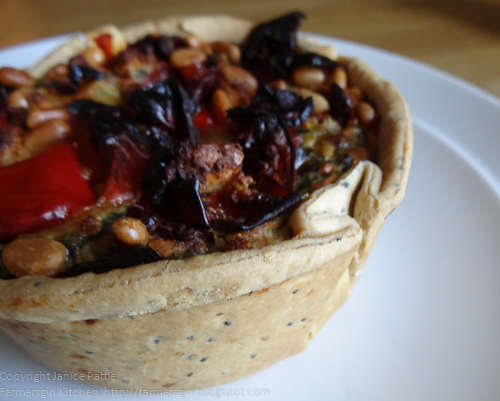 This is the Spinach Feta and Toasted Pine Nut Pie, it's not very big (270g) and if you were to serve it as a single portion it would be quite expensive as the pies retail at around £3.49, but it was bursting with flavour and stuffed full of good things. 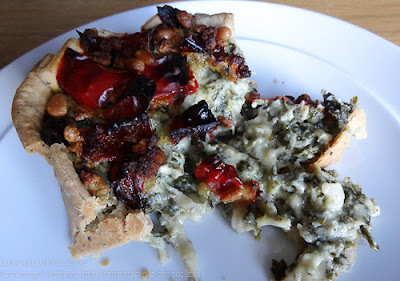 It easily served two with accompanying veg or salad. Sorry about the mess! I wanted to show you the lovely creamy spinach filling which goes so well with the crunchy pine nut topping. Pie #2 is British Beef, Stilton and Ale and has to be my favourite. 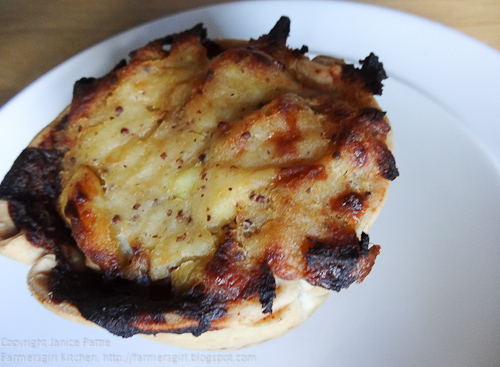 I don't often buy beef pies because I am usually disappointed with the sloppy, gloopy gravy and a game of hunt the beef. 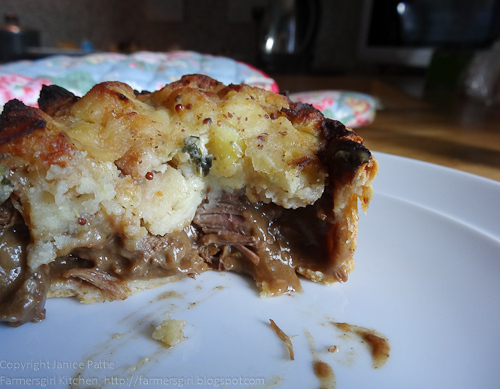 This pie is different, just look at those chunks of real beef and thick gravy and the mashed topping with a little tang of Tuxford and Tebbit Stilton cheese really did taste homemade. I would definitely buy this pie again. And the pint? 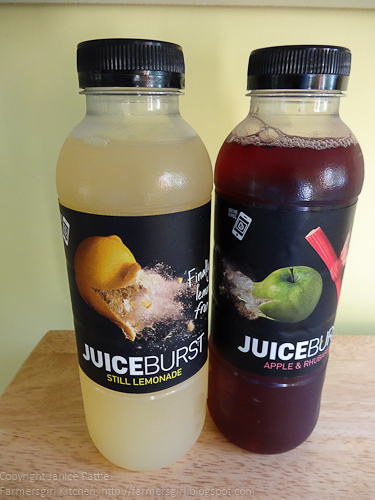 Well, sorry to disappoint if you were expecting something alcoholic, I just wanted to entitle the post 'a pie and a pint' and I wanted to tell you about these Juice Burst fruit drinks. Juice Burst is the first digitally interactive soft drink - WHAAT? I hear you say, well if you 'blipp' the bottle you'll be taken into an interacive world, where the fruit literally bursts off the label and out of your phone/ipad. You'll be invited to play the fruit machine game where you could be in with a chance of winning your own stash of JuiceBurst. There are 14 flavours to choose from but I was provided with a bottle of Apple and Rhubarb and a bottle of Still Lemonade, each bottle contains 500ml (not a pint!) RRP £1.29. These are two of the new flavours, the other being Orange and Passionfruit. I'm not a huge fan of fizzy drinks and usually drink water or if I want a flavoured water, I use cordials, but if I was out and about and looking for a soft drink, I would buy one of these Juice Burst drinks as they have a fresh fruit flavour and are not too sweet. The digital interactive thing really isn't my thing either, I'm more interested in what is in the bottle than playing games with it, but I'm sure it will appeal to many people for a bit of fun. Juice Burst is stocked at WH Smiths, Superdrug, Onestop, Greggs and selected Tescos stores. You can find out more about Juice Burst, the first digitally interactive soft drink on their Facebook page and You Tube channel. Thanks to Hannah for the vouchers to purchase the Higgidy pies and thanks to Emily for supplying the Juice Burst drinks. I was not paid to write these reviews and all opinions are my own.